Have you forgotten your Windows 7 password? If the administrator account you are trying to access has been disabled, expired, locked out or simply reject your password, you’ll lose control and can’t install software, update drivers or do any kind of administration whatsoever. Don’t panic. Just boot your computer from a Ubuntu Live CD or USB drive, and then run the chntpw program which enables you to unlock / reset forgotten Windows admin password. The following tutorial will walk you through the procedure to reset Windows 7 admin password with Ubuntu Live CD/USB drive. 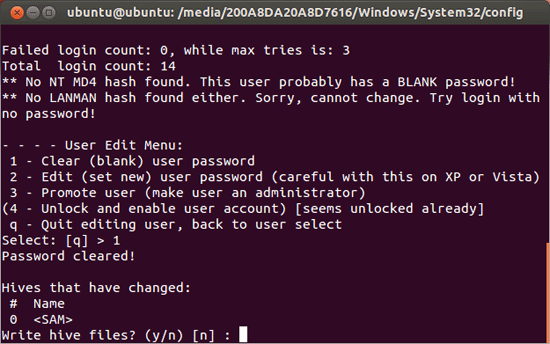 How to Reset Windows 7 Admin Password with Ubuntu Live CD/USB? 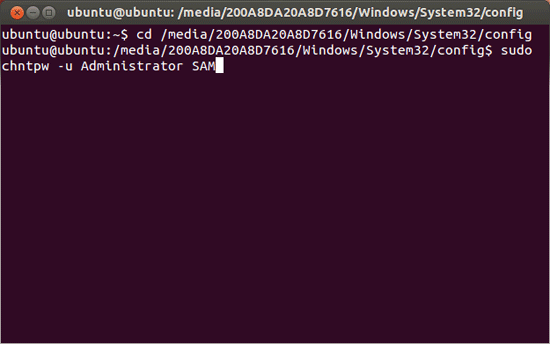 Boot the machine that you’re having trouble with from Ubuntu live disk. If you don’t have one, you can create a Ubuntu Live USB drive with the freeware Universal USB Installer. 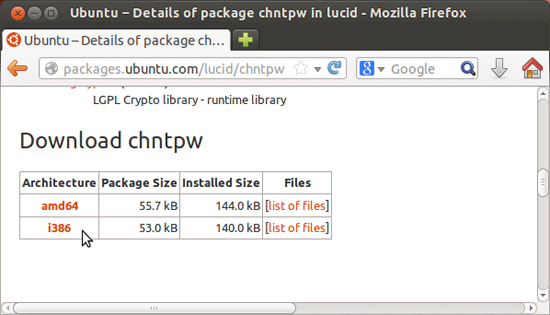 After booting into Ubuntu, open the web browser to download chntpw from the Ubuntu Universe repository: http://packages.ubuntu.com/lucid/chntpw. Scroll down to the download section and grab the chntpw setup package. If your Ubuntu is 64-bit, please use the 64-bit version instead. Once it’s downloaded, double-click on the downloaded file to install it on your Ubuntu live disk. By default the system will automatically mounted the hard disk partition where Windows 7 is installed, and you can access the Windows partition from Places menu. 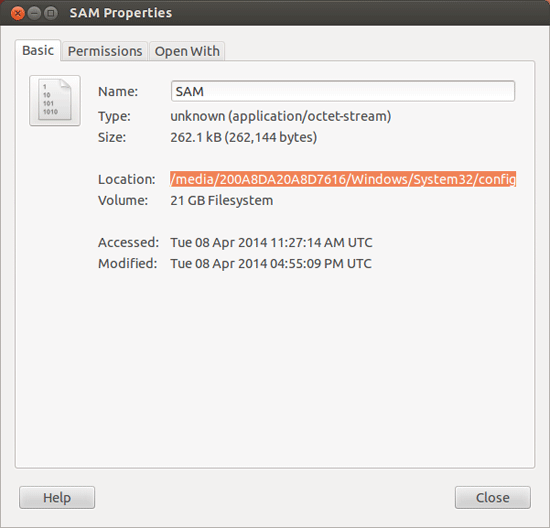 Click on your hard disk and navigate to the SAM file where Windows stores your Windows login password. 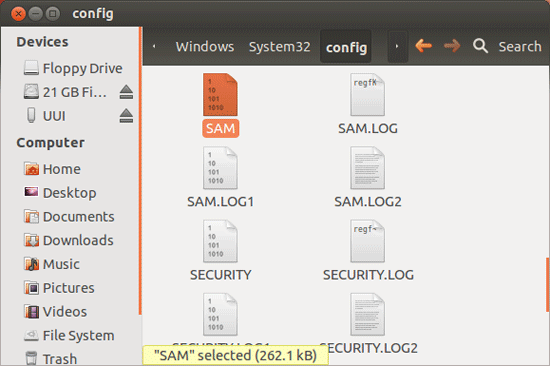 Right-click on the SAM file and select Properties. In the Properties dialog, note down the file location which will be used in the next step. 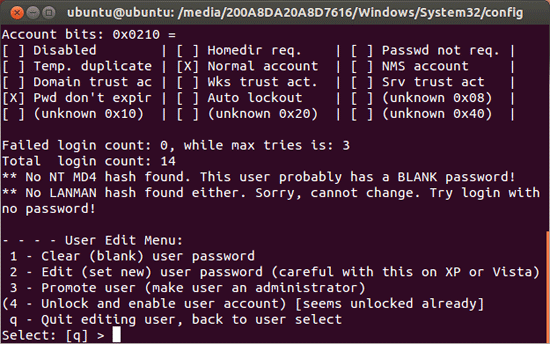 Chntpw will show all the configured Windows user accounts with their current status. It presents 4 different Windows user account tweaking options at the bottom, including clear / blank user password, Set a new password / edit password, promote user to administrator, and unlock locked or disabled user account. Type 1 and press Enter. Once you’ve cleared the user account password, type y to save your changes. 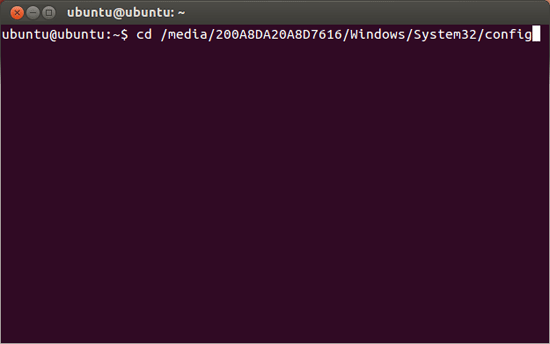 Reboot your system, and plug out Ubuntu Live media disk. You can then log in to Windows without a password! While Ubuntu Live CD is widely used to troubleshoot PC problems, you can use it to reset Windows 7 administrator passwords as well. Follow this tutorial and you can regain access to your computer on your own when you forgot the password. No need to pay a premium price to one of the geek squad out there to take care of it for you.